Today’s breakfast example appears to be a little on the small side. I guess it would be small for an adult, but not a child. Yesterday morning I was running late and only had time to grab a KIND bar as I was leaving the house. So the breakfast pictured above might be better than what I ate by some standards. 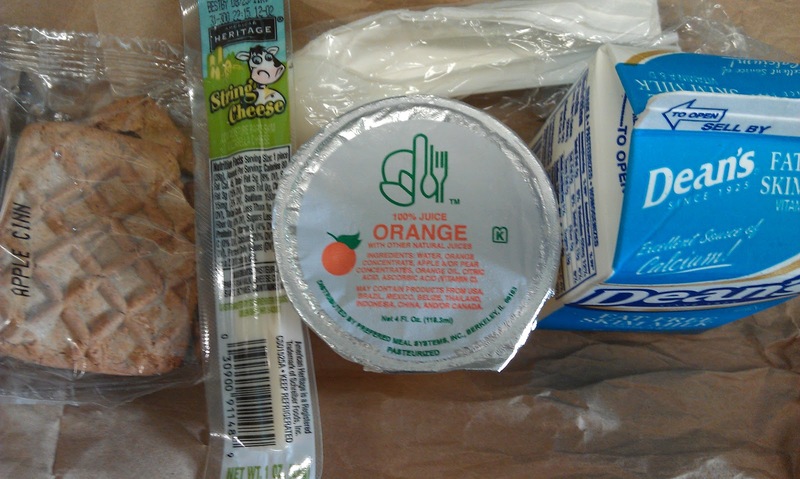 I like that the kids are getting string cheese, which is a favorite food for kids and gives them a little protein. What I’m less crazy about is the processed bar/graham/cracker/cookie. Without knowing the ingredients, I can’t say whether the crackers contain whole grains or refined flour or who knows? I can only guess. On the upside, this breakfast can be consumed quickly and it doesn’t require silverware. One of the arguments from people who disagree with the breakfast in the classroom program is that it cuts into instructional time. Overall, the kids eat their breakfast efficiently and I don’t see a negative impact. The bottom line is that it’s hard to teach a hungry kid. The transition has been easy: having breakfast in the classroom is just an accepted part of the morning routine now. People don't like this program because BREAKFAST cuts into instructional time? I can't even find the right words for how ridiculous that seems to me. There are so many things invading schools, diminishing instructional time (*ahem* standardized testing?) Something like this, which is beneficial to the students, and as you say has quickly become routine rather than a distraction, should be considered as essential as letting students eat lunch or go to the bathroom. (I wanted to include recess in that, but since your kids don't get recess I suppose not everyone considers it essential.) It seems to me that NOT serving breakfast would cause more lost instructional time due to the distracted, hungry kids. I just graduated with a music education degree, and did my student teaching in an elementary school, K-5, with more than 1300 students. Something like 80% of them are free/reduced lunch, and every single day, the cafeteria served breakfast and lunch to nearly all of those 1300 students. The kids arrive at school, put their stuff in their classroom, and head straight to the cafeteria. I was so thrilled to see that– even if they aren't eating at home, they are doing "okay" with two good meals at school. I admire the cafeteria staff at that school greatly. They feed 1300 students (plus a bunch of teachers) every day, get them in and out of the cafeteria efficiently, for two meals. Furthermore, each time I was in the cafeteria, I saw how much they loved and cared for the students. They smile and give hugs and greet the students by name, even though they are working so hard to keep things running on schedule. Sorry that my comment is so long– I've been reading the blog for a long time and haven't really commented before. I guess it has all built up! I'm glad the transition is going smoothly. I love the idea and would like to see more schools implement it where needed. Graham crackers as breakfast isn't cutting it for me, though. Those were considered a snack when I was a kid. Do you think it would be appropriate for the school or a teacher to send letters to the parents of the children that aren't eating a proper breakfast or lunch? This actually looks like a decent breakfast. String cheese is an easy to eat and kid friendly way to have a little protein in the morning. I hate seeing the breakfasts that are nothing but cereal and juice. With all those carbs and no protein I would be starving by lunch. White milk is healthy. Whole wheat flour in the cracker would have been nice and Fresh fruit would have been better then juice but you can't win them all. Looks like an OK way to start the day, especailly if for some it was this or no food till lunch. I wish the breakfasts looked like this in our district. I have no problem with my students eating during the school day. I talk to them about healthy foods choices. There are often bananas at breakfast. I “break the rules” and tell the kids to bring the fruit from breakfast to class so they can eat whenever they want during the day. If fruit is their only choice for a snack, they will eat it if they are hungry. Its ridiculous to say that breakfast cuts into instructional time. I do have a problem however with other breakfast options like juice with artificial colors, breakfast bars with unreadable ingredients, and pancakes with syrup as well as other things.